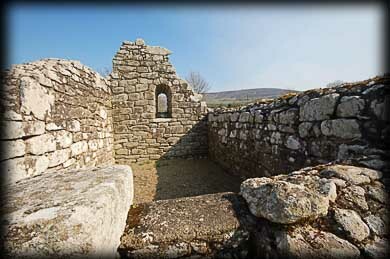 The delightful oratory at Killoughternane was built in the 10th century on the site of an earlier timber church founded by St Fortchern. The church is less than 5.5 metres in length by 3.5 metres wide internally, with granite walls 0.8 metres thick. There are antae at either end of the gable walls. 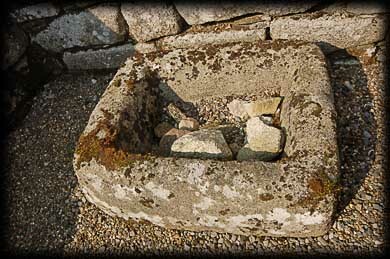 Inside the oratory in the north west corner is a rectangular baptismal font, pictured below. A survey carried out in 2001 showed traces of early monastic buildings and a megalithic burial under the oratory. 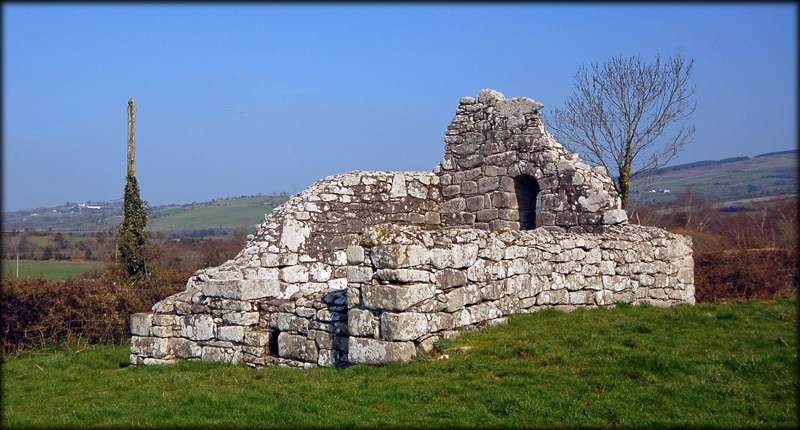 St Fortchern (aka St. Fortiarnán) was born in Trim, County Meath. He was a son of Feidhlim, who was a brother of the High King Laoire. He studied under St Loman a companion of St Patrick. 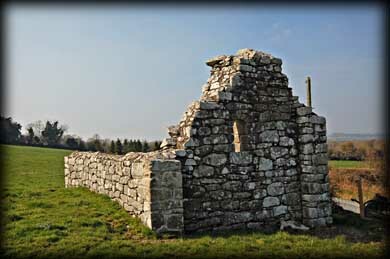 St Loman is said to have appointed St Fortchern to succeed him as the Bishop of Trim. He resigned after three days and left Meath to become a hermit. After traveling to the kingdom of Uí Dróna he founded a monastic community at Killoughternane (Cill Fortchern, meaning church of Fortchern). Amongst the monks who studied here was St Finnian who went on to found the famous monastic school at Clonard in County Meath. Situated: From Myshall head South on the R724. Go straight through at the first crossroads. 750 metres turn right. 650 metres turn right. 2.5 K turn left. 280m turn right. At Ballinree turn left. 1k turn left. 900metres turn right. 1 kilometre down here the church is on your right. Discovery Map 68: S 776 542. Last visit March 2011.